Clemson, SC—The National Dropout Prevention Network (NDPN) recognized the first two graduates of its National Dropout Prevention Specialist (NDPS) certification program during its recent national conference in San Antonio, TX. 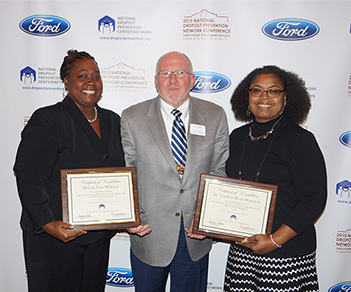 These first two program completers are Dr. Charlene Hampton, GEAR Project Director for Jones County Schools in Gray, GA; and Ms. Melinda Faye Williams, Director of the Upson-Lee Learning Academy in Thomaston, GA. The NDPS certification program was announced in November 2014 at NDPN’s national conference in Louisville, KY, and inaugurated at NDPN’s February 2015 At-Risk Youth National Forum in Myrtle Beach, SC. The NDPS certification verifies participant knowledge and expertise in at-risk youth issues and strategies for increasing graduation rates. The certification program is open to all professionals who work with or on behalf of students, including educators, counselors, school administrators, at-risk youth workers, and board of education members. As NDPS certification program participants, Dr. Hampton and Ms. Williams attended professional development workshops at the 2015 At-Risk Youth National Forum and the organization’s September 2015 Diploma Planning Institute in Biloxi, MS. All workshops required for the certification are based on the NDPC/N’s 15 Effective Strategies for Dropout Prevention framework, which is comprised of fifteen recommendations in the categories of School and Community Perspective; Early Interventions; Basic Core Strategies; and Making the Most of Instruction. To secure their certification, participants are also required to submit to the NDPC/N Model Program Database or provide a field project report detailing an effective dropout prevention initiative in which they are involved or which they designed. Dr. Hampton and Ms. Williams both work with Upson-Lee Learning Academy’s GEAR (Gateway to Education Achievement and Reengagement) program and thus submitted a joint field project report on dropout prevention and intervention efforts through that program. GEAR is the local title of a program funded through the U.S. Department of Education’s High School Graduation Initiative operating in Jones, Greene, and Upson (GA) counties. Both graduates will add their NDPS certification to impressive educational backgrounds. Ms. Williams holds an EdS degree in educational leadership and an MS in education, both from Troy State University in Phoenix City, AL; and a BA in human services from Mercer University, in Macon, GA. Dr. Hampton earned her EdS and EdD in educational leadership from Argosy University in Sarasota, FL; an MS in education administration and supervision from Albany State University in Albany, GA; and a BS in home economics education from Fort Valley State University in Fort Valley, GA.
Dr. Sandy Addis (center) Director of the National Dropout Prevention Center/Network (NDPC/N), is pictured with Ms. Melinda Faye Williams (left) and Dr. Charlene Hampton (right), the first recipients of NDPC/N’s National Dropout Prevention Specialist certification.